Our guide to Houston will help you find the best dog friendly places in Houston Texas. Houston is the fourth-largest city in the United States, the largest city within the state of Texas, and "the energy capital of the world." In the mid-twentieth century, Houston became the home of the Texas Medical Center—the world's largest concentration of healthcare and research institutions—and NASA's Johnson Space Center, where the Mission Control Center is located. Houston is a multicultural city, in part because of its many academic institutions and strong industries. Houston has an active visual and performing arts scene. The Theater District is located downtown and is home to nine major performing arts organizations and six performance halls. There are tons of great dog friendly places in the city of Houston, our city guide will help you find the best dog friendly places. You may have a hard time deciding what to do in Houston, but we make your decision easy. 16154 Westheimer Pkwy - Millie Bush Bark Park is located on Westheimer Parkway in George Bush Park, Houston, Texas. 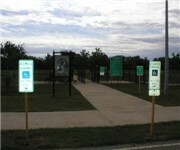 16756 Westheimer Pkwy - Millie Bush Dog Park is a 13 acre off-leash dog park located in Houston Texas. 4700 Westpark Dr - Danny Jackson Dog Park is an off-leash dog park in Houston Texas. 4828 Loop Central Dr, (281) 496-2177 - Danny Jackson Family Ball Park is a dog friendly off-leash dog park located in Houston TX. 7704 Bay Area Blvd, (281) 474-2551 - The only dog park within 40 miles. Located in the Bay Area Park. 638 W 20th St, (713) 864-4777 - Heights Urban Dog is a dog friendly pet store located in Houston TX. There are plenty more dog friendly places in Houston. See all dog friendly places in Houston Texas.